Klik! 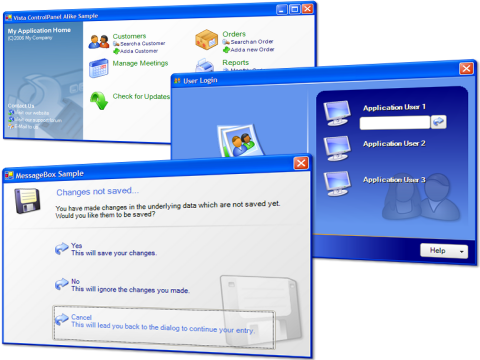 EntryLib.Net is a set of User Interface controls/components designed especially to create eye catching and elegant user interfaces/data entry screens in your .Net Windows Forms applications. It consists of a total of 22 controls which each brings a revolutionary fresh new look and rich features to your applications. - Optimized drawing routines which causes your forms to load and draw much faster than v1 which will allow you to use the library in any crowded screens. - New Office 2007 styles with blue, silver and black color schemes. Each scheme is provided in classic and modern form to mimic the latest Office 2007 look. 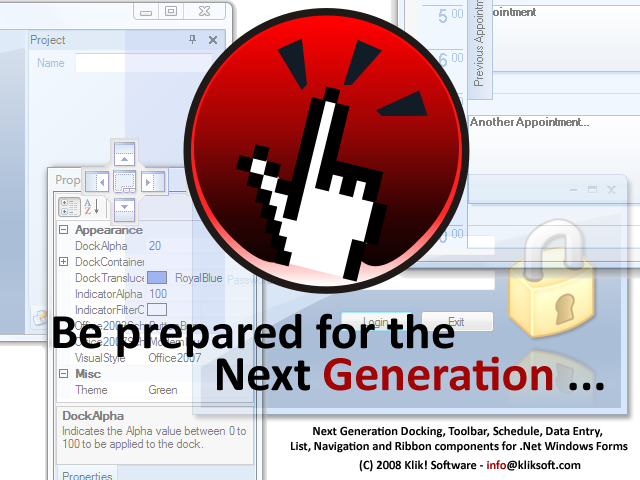 - New KRichToolTip component provides Office 2007 style tooltips. 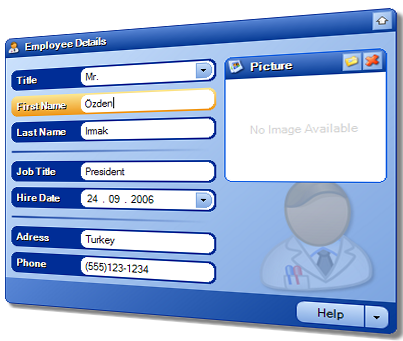 - New KFormManager allows you to style your forms, including it's borders, with Office 2007 or any other custom style. 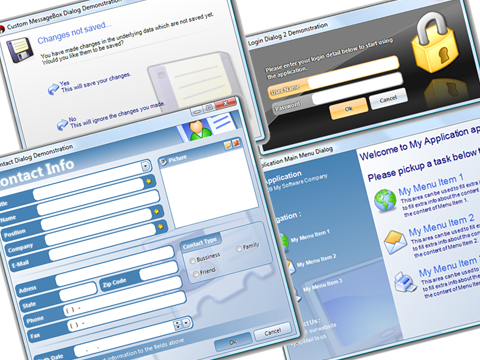 - New ELModalBox component brings the well known ASP.Net modalbox dialogs into the Windows Forms world. - New ELProgress control allows you to represent your long going processes either in Bar or Circle style, with static and animated options. - New ELDataGridView enhances the regular DataGridView with advanced visual features. - New design-time Qucik Access Menu allows you to reach many common elements from one place such as predefined styles, edit/load/save style actions, specific control/component features such as editing items, etc. Each control in this library has designed to be flexible and eye catchy in their look. First of all, they support border shapes other than standard rectangle as rounded, circle of chamfered. Their backgrounds can be filled with advanced gradient colors. Images you have associated with controls can be drawn in AlphaBlended form. Texts in the controls can be drawn with advanced effects such as Glow and DropShadows. All these advanced drawings can also be customized for different states of the controls such as hover, focus and soon. Managable styles of controls allows you to change your applications look whenever you want with ease. Each control supports built-in Office 2007 and Office2003 color schemes but anytime you can surpass this and use your own created styles easily thanks to StyleManagement feature of Klik! EntryLib.Net. We have also included 7 ready to use style sample with the package to you as Office 2007, Office2003, CoolBlue, SoftXP, IceBlue, BurningRed and LiveGreen. Quick Access Menu in design-time allows you to apply these styles with a click. All controls in Klik! EntryLib.Net is also Turbo Charged in functionality area. For example, ELEntryBox control has a caption by default, includes 4 different validationstyles, have the ability to include buttons in it's EditBox area with custom dropdown feature. ELRichLabel control is a lightweight HTML kind of formattable label control with elements such as Tables, Links, Font manipulation and much more. ELComboBox also has a caption by default and combines standard and checked combobox functionality into one control. ELRichPanel offers Header and Footer parts, ability to add buttons into those parts and show 'FooterHints' in it's FooterPart. ELListBox combines standard and checked listbox functionality in one control. ELButton can act as a dropdown button as well besides it's standard functionality. Each of this functionality can be adjusted with user friendly properties and property pages in Design-Time as well as Run-Time. - Input : ELEntryBox, ELCheckBox, ELRadioButton, ELCalendar and ELCalculator. - List : ELListBox, ELComboBox and ELDataGridView. - Panel/Container : ELRichPanel, ELPanel, ELGroupBox and ELContainer. - Decorative/Presentation : ELLabel, ELRichLabel and ELDivider. - Styling : KFormManager and KStyleManager. - Notification : KRichToolTip and ELProgress. The best way to see what our products does is to download and evaluate a trial version. Please click here to get the trial version of Klik! 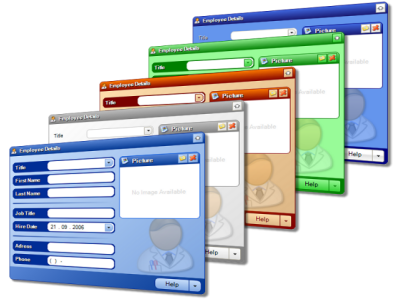 EntryLib.Net v2.0 for Windows Forms. A Murphy rule says that no application can be bugfree! :) Please click here to get the latest update pack for Klik! EntryLib.Net v2.0 for Windows Forms. I'm pleased to say that the Klik! Support team was able to find the bug and send me a new build of KRes2.ocx that fixed the problem! This was very fast, and very helpful, I'm impressed. The workaround did work, but this is even better. I told a co-worker about this over lunch and though he's less of a 3rd-party fan than I am, thought this was about 'best case' support. My own clients really liked that their windows were remembering the last size/position they used them (a SizePos feature) and that my largest screen now works much better on a 800x600 screen (a Resizer feature) Thanks!